Russian athletes condemned in doping scandal, Moscow's monumental Tolkien symbol dubbed satanic, while Gallic thespian Gerard Depardieu escapes with a slap on the wrist for awful accent in Russian language video, notes Aliya Sayakhova. Last week saw the emergence of what is potentially one of the biggest doping scandals in the history of international athletics. German TV network ARD screened a documentary revealing allegations that 99% of the Russian Olympic team use performance-enhancing drugs, in a scandal that has been covered up at national and international levels. The film claims that Russian officials accepted payment from athletes to supply banned substances, and that the IAAF (International Association of Athletics Federations) was complicit in covering up the abuse. The documentary prompted a furious reaction from all those involved in athletics: Valentin Balakhnichev, president of the Russian Athletics Federation dubbed the film “a pack of lies”; Nikita Kamaev, head of the Russian Anti-Doping Agency said he doesn’t "understand German and therefore cannot comment”; David Howman of the World Anti-Doping Association described the allegations as “shocking”; and Lord Sebastian Coe, an IAAF vice-president, admitted it was a “very, very difficult time” for the sport. All the parties announced they would carry out their own investigations. However the documentary’s doping revelations don't only concern Russia, as presented in the Guardian’s series of articles on the subject. The Telegraph reveals that one of Britain’s biggest athletics stars allegedly escaped a doping inquiry after the IAAF failed to act on “suspicious” blood samples and perform what is known as target testing, necessary in order to prove whether doping took place. The list compiled between 2006-08 also contains names from Spain, Morocco, Kenya and Germany, along with three from the UK. However, given the level of scrutiny that Russia has been receiving in the British press lately, it is small wonder that Russia takes centre stage in this story. Mr. Balakhnichev described the accusations as "a provocation aimed at undermining Russian sport". One wonders whether a new wave of sanctions might be awaiting Russia, this time concerning sports, rather than politics or economics. Those with long enough memories have not forgotten America's boycott of the 1980 Moscow Olympics, prompted by the Soviet invasion of Afghanistan. Christmas is not exactly the right time to worry about sport and fitness though. Having booked my holidays in Russia a few days ago, I am now wondering whether I should be worried about the prospects for my stay in the capital: the Russian Orthodox Church has warned of bad tidings for the city, all thanks to a symbol borrowed from a series of English children's books that was due to be put up on the 21st floor of a skyscraper this week. The rooftop light installation that scared church officials so much is a giant flaming Eye of Sauron that a property company plans to build to celebrate the release of the final part of Peter Jackson’s movie adaptation of The Hobbit, reports the Guardian. At the centre of Tolkien’s fantasy novels, the Eye of Sauron is controlled by a "dark lord" that gives him the power to watch anyone wearing a black magic ring. The large sphere uses back projection to create a 3D effect in light, which sounds pretty harmless to me. But the church is condemning it as a satanic symbol and warning listeners of Govorit Moskva radio station of dire consequences if the plans go ahead. The designers of the eye, a design group called Svecheniye, which means radiance, meant no harm, and don't even have an eye for profit; they are simply keen followers of Tolkien who approached the property company with the idea, according to a spokeswoman for the building's owners, Hals Development. It was the second time this week that the Russian Orthodox Church and demonic forces were coupled in British press reports. There was also the photo captioned “A priest casting out demons from the servers of the Central Bank responsible for maintaining the course of the rouble," that went viral on Twitter after being posted on Facebook by famous Russian blogger and art curator Marat Guelman. TheBusiness Insider did a little investigation and posted a story explaining that the photo does indeed show a priest sprinkling holy water on banking hardware, but one taken in 2001. It had nothing to do with the current vicissitudes of the Russian currency. The picture actually showed the priest blessing the payment systems for a company called Rapida. The Business Insider was an abundant source of some first-class Russia-related stories this week: in a different article, the online news site presents a YouTube video featuring French-born, now Russian, actor Gerard Depardieu, advertising Swiss luxury watch brand CVSTOS’s new “Proud to be Russian” range. In the video, the actor is unquestionably proud to demonstrate his knowledge of the Russian language (he speaks Russian at an almost comprehensible level throughout the video), as well as some gestures presumably acquired in his new home country, such as an unexpected table punch and an enigmatic smile at the end. Oddly, the publication found the ad rather intimidating, but perhaps a Russian viewer could relate to it better? 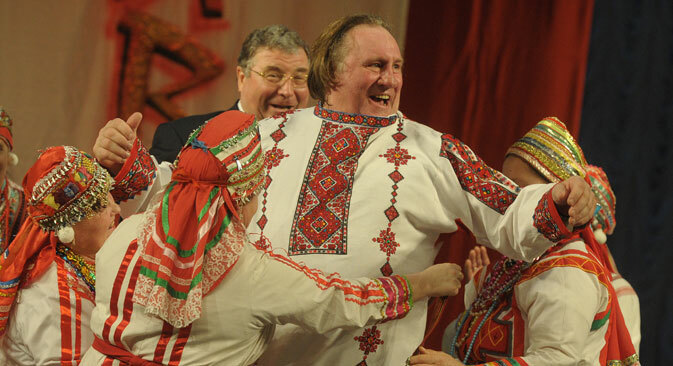 President Vladimir Putin granted Mr. Depardieu Russian citizenship in 2013, after a bitter tax dispute with the French government when President Francois Hollande said those earning more than a million euros a year would have to surrender 75pc of their income in tax. Russia magnanimously offered the actor its flat rate 13pc personal income tax along with the passport. A grateful Gerard responded with an open letter declaring his love of the country, people, history and writers, adding that his father was a Communist who listened to Moscow radio. He also promised to learn Russian, a promise we now know he has fulfilled, most probably using nothing but some good French wine as doping.